From the moment you are greeted by our friendly hostess and charmed by one of our wait staff you will experience a feeling of sitting in one of your favorite New York Italian Restaurants right here in Boynton Beach. In the area for the “Big Game?” Come and watch it with us on one of our flat screen televisions while enjoying your favorite drink in our fully stocked liquor bar. Not only do we specialize in Italian food, but we also specialize in your favorite “finger foods” like our barbecue wings, pancetta burger sliders, and cheesy spinach dip. When you are here don’t forget to try one of our delectable homemade Italian deserts and specialty coffees sure to make sweet dreams come true. We offer catering for your next party at our restaurant, your home, and office. So why not give us a try today. 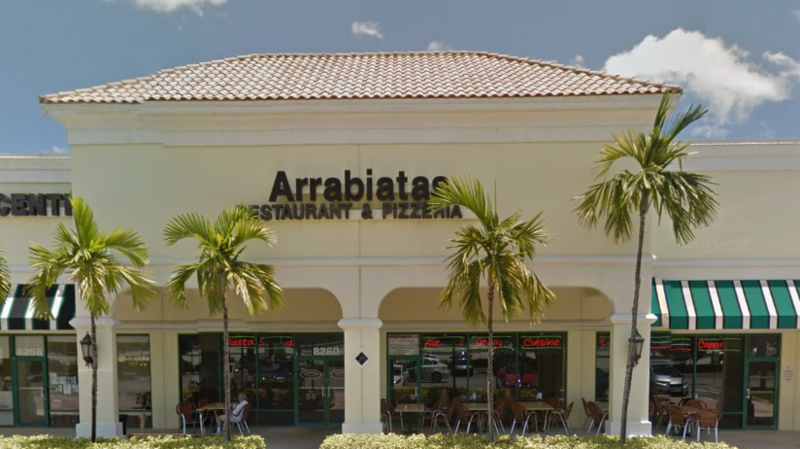 When the owners decided to open Arrabiatas Italian Restaurant they wanted to bring fresh, homemade New York Italian food to Boynton Beach, Florida. From the moment you are greeted by our friendly hostess and charmed by one of our wait staff you will experience a feeling of sitting in one of your favorite New York Italian Restaurants right here in Boynton Beach. With an extensive menu featuring appetizers, soup and salads, Italian favorites, savory pastas, specialty pizzas, calzones and handmade Panini’s, we are sure to cure any Italian cravings you might have. We also offer fresh seafood dishes, choice meats cooked to perfection, and a list of nightly specials to enhance your dining experience. Since the first time we went, we knew we would go back. We have been coming back about once every 2 weeks for about 6 months.I don't know of too many restaurants in So. FL that doesn't have an older crowd especially during early bird. I have definitely seen worse, and the last time I checked none of us are getting younger. My take on an older clientele is they know good food by now, but Arrabiatas is by no means a senior center. Anyway my go to is the chicken sorrentino without the peas. 2 large size pieces of tender chicken topped with eggplant and prosciutto for $15.95. If that's overpriced I don't know what to say. My wife and kids have always been satisfied with their meals. I have ordered two specials which are a little pricey, but they are specials. The veal special is so huge the ends hang over the plate, almost impossible to finish. The other special I ordered was the duck topped with a blueberry sauce, so good I thought I as eating dessert. The wait staff has always been terrific, and the manager has always been attentive to everybody's needs. I have seen him numerous times helping out, whenever somebody has a problem or a special order. Such was the case with another couple we went with and the wife was gluten free. I have had only one experience with a long wait for our food to arrive, but the restaurant was full and the staff was a little shorthanded. They also have a great lunch menu.Do yourself a favor, check them out you won't be disappointed. The entire staff from the host to the food runners were excellent but our server was exceptionally good. She was very thorough in explaining the menu and recommending her favorites. I love that they offer low carb options like zoodles and healthier ww pastas! Also they can make any meal with tons of veggies. Everything was fresh and delicious. I had the whole wheat pasta with chicken piccata and all the veggies and my husband had the meat and marina spaghetti. Both super yummy. Our kids enjoyed their meals off the kids menu too. I can't wait to go back and try something else. We will definitely be back soon.